A novel adsorbent based on the surface of magnetic graphene oxide-grafted cellulose nanocrystal molecularly imprinted polymers (Mag@GO-g-CNCs@MIPs) was developed for the selective extraction and fast adsorption of fluoroquinolones (FQs) from river water samples. Cellulose nanocrystals (CNCs) were grafted onto activated graphene oxide (GO), and the surfaces of the obtained magnetic GO-g-CNC particles were molecularly imprinted with polymers using ofloxacin (OFX) as a template molecule and methacrylic acid (MAA) as a functional monomer. The resulting Mag@GO-g-CNCs@MIP material was characterized by Fourier transform infrared spectroscopy, transmission electron microscopy, scanning electron microscopy, vibrating sample magnetometry, and X-ray photoelectron spectroscopy. Under optimum adsorption conditions, the Mag@GO-g-CNCs@MIPs with large specific surface area were easily collected and separated using an external magnetic field. Mag@GO-g-CNCs@MIPs exhibited an ultra-fast adsorption profile for FQs (5 min to achieve the maximum adsorption capacity of 74 mg/g), with imprinting factor values ranging from 1.5 to 3.1. 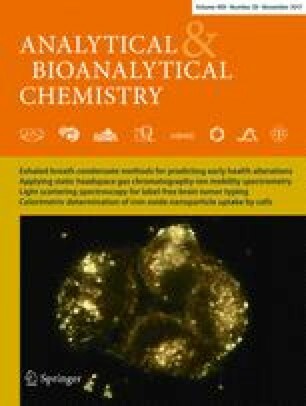 High recognition selectivity towards nine FQs from real river water samples was established through coupling with high-performance liquid chromatography (HPLC), and the recovery of samples spiked with nine FQs was found to be in the range of 79.2–96.1%, with a detection limit ranging from 6.5 to 51 ng/g. Moreover, the data obtained adhered to the Freundlich isotherm model, and the adsorption kinetics followed a pseudo-second-order model. Finally, the Mag@GO-g-CNCs@MIPs could be regenerated and reused for seven consecutive cycles with only a 13% drop in adsorption capacity, indicating its effective application as a new, reusable, and selective adsorbent for the enrichment and separation of FQs from aqueous solutions. The online version of this article ( https://doi.org/10.1007/s00216-017-0619-9) contains supplementary material, which is available to authorized users. The authors are grateful for the support of the National Natural Science Foundation of China (21476212) and the Foundation of Science and Technology Department of Zhejiang Province (2017C33126).